What Drives the Cost of College | Confident. Returns. What Drives the Cost of College – Confident. Returns. With all of our clients who have children, planning for college expenses is the one of the biggest concerns that keeps them up at night. Retirement planning may be a bigger issue in the long term, but the children will be going to college a lot sooner than their parents will retire. As I work on putting together plans for clients to balance their own retirement and send their kids to a good college, I find myself stepping back wondering how college became so expensive. Since the mid 1980s, the cost of college has increased 500%! And it continues to grow faster than inflation. Today’s students are graduating with a mountain of debt. In fact, there is now more student loan debt than credit card debt. What does this chart say? Over the last twenty years, items in blue have actually gotten cheaper. TV’s, software, toys, cars and clothing are all cheaper than they were twenty years ago. 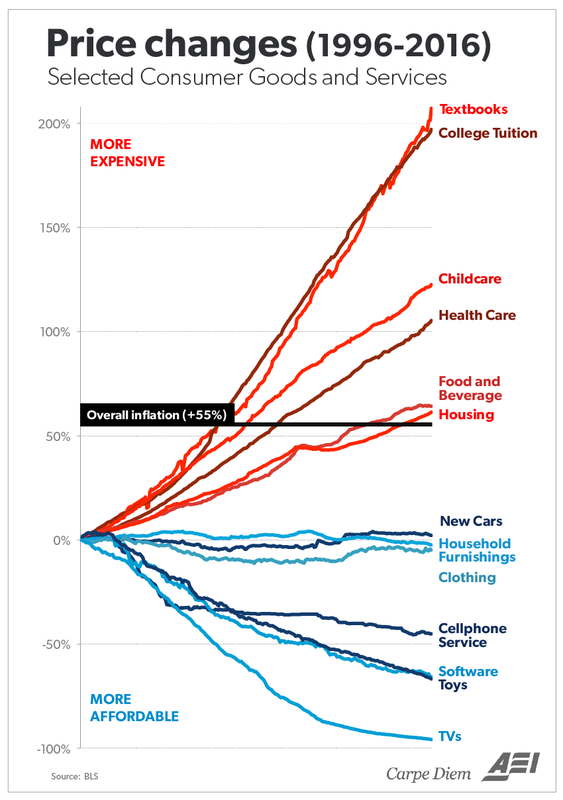 The items in red, such as housing, food, health care, childcare and COLLEGE have gotten more expensive over the years. As much as we complain about the escalating cost of healthcare, it’s not nearly as bad as college. How did we arrive at this problem? A simple answer is that money is freely available for people to borrow to pay for college. The cost does not become a big driver in the decision making process when there are grants, scholarships, tax credits, and even loans involved that mitigate the financial bite. This results in universities having to offer more services, bigger buildings, better facilities, etc in an effort to attract students who are not as cost conscious as before. With the government stepping in to provide assistance (loans and tax credits), they are actually contributing to the problem and making it worse. They are creating a gap between the perceived cost a student pays to go to college and the actual cost to attend. This happened with real estate when the government wanted everyone to own their own home – loans and incentives fueled the market. The good intentions of the government backfired as people were given mortgages they couldn’t actually afford, which spurred housing prices to soar… for a while at least. A similar problem exists in health insurance. The insured are insulated from the true cost of a service because the health insurance pays for most of the expenses incurred. If you’re interested in reading more about this and seeing the kinds of solutions that might work, I found this article to be a fascinating read on the subject of college costs.